Beautiful and rare open mouth version of the Kammer and Reinhardt ” Mein Liebling ” incised ” K&*R Simon and Halbig 117 70 “, 27 1/2″ ( 70 cm ) tall, with brown glass sleep eyes, painted upper and lower lashes, multi-stroke lashes, pointy nose, open mouth with four upper porcelain teeth, pouty upper lip, and deep dimple in the chin. She is the original pinkish-yellowy wood and composition fully jointed body with excellent original finish, and wears a fantastic original mousy blond mohair wig with side bangs with two short braids tied with red silk ribbons, a two piece blue and white sailor dress with red neck tie , antique underwear, antique black knit socks and antique black leather shoes and a nice straw hat with cloth flowers. This mold is actually quite rare, much more so than the closed mouth 117’s, and is much earlier and has totally different facial modeling than the more common seen ” 117n’s ” that are primarily from the 1920’s, often with flirty eyes on the so-called ” teenage ” or ” high knee ” bodies. A beautiful mostly original doll the that would be a nice ” comparison companion ” for your closed mouth 117!. US$ 2,450. Excellent quality and appealing size ( 11 ½”, 30 cm ) model of the Kammer and Reinhardt “ Marie “ with head incised “ K&*R 101 30 “, having molded and painted facial features with blue eyes, on the original good quality pink fully jointed body with original finish. She wears the original dark blond mohair wig with center part with two long braids covering ears and extending downward below the shoulder level. She is costumed in a one piece pleated 1910-style cream wool dress with embroidered flowers and green feather stitching trim to simulate stems, a well- coordinated bonnet, antique underwear and antique brown leather side button boots and pink cotton socks. The facial modeling is exceptional and unlike most painted eyed K&R characters the wig pull level is practically non-existent with barely a few tiny specks of such on back of the head. As collecting trends tend to go back and forth with the wind and tides, these smaller versions of these characters seems to be leaning toward “ smaller is better “ at the moment so here is your time to take advantage if it is your current preference…….. ……US$ 1,350. Lovely 18″ ( 46 cm ) example of the ever popular Kammer and Reinhardt character ” Marie ” with head incised ” K&*R 101 46 “ and having pale blue painted eyes with black upper eyelid liner , short half stroke single eyebrows, and superior facial modeling featuring a closed pouty mouth and deep indentation depressions around the mouth and chin with evenly painted coloring with slight blush to the full cheeks. As is common, she does have some typical wig pulls around the very top of open rim edge and on back of head, but none on the actual forehead and with all fully covered with the wig in place. The pink fully jointed body with original finish is original to the head and other than one finger on the left hand which had been broken and well re-glued where it is joined with the palm, it is in very good condition. The off-white linen and lace dress is period and possibly original as are the two-color black and white leather and canvas shoes. The rich brown antique mohair wig with left center part is also in excellent condition and possibly original and definitely antique. 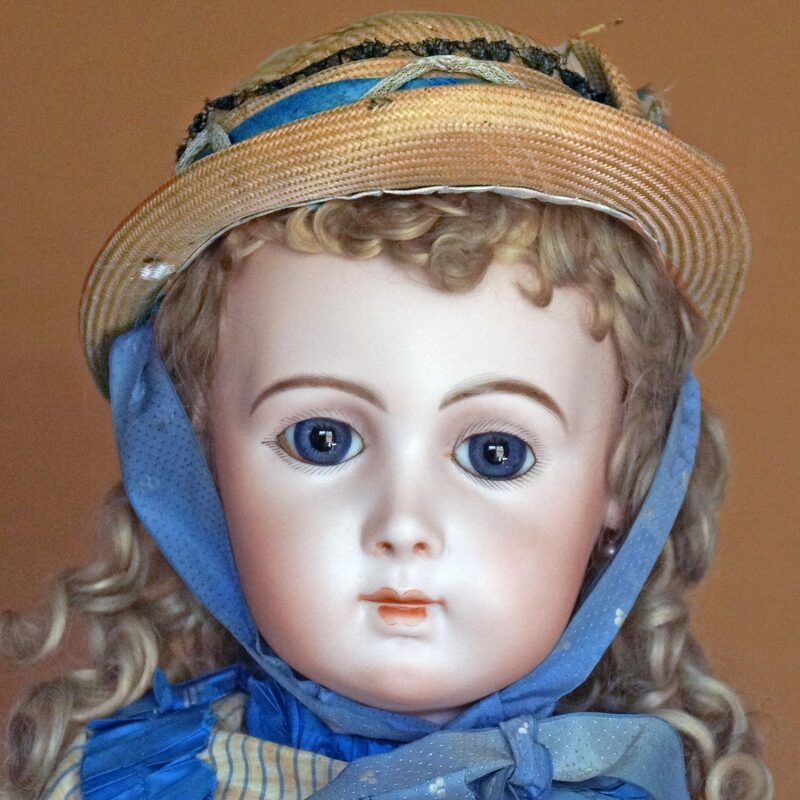 The nice straw hat with silk ribbons and cloth flowers is antique but possibly not quite as old as the doll and her other garments/accessories. A little gem at a very modest price of ……………………….US$ 1,950.